The perfect social media tool for Twitter, Facebook, and Foursquare. 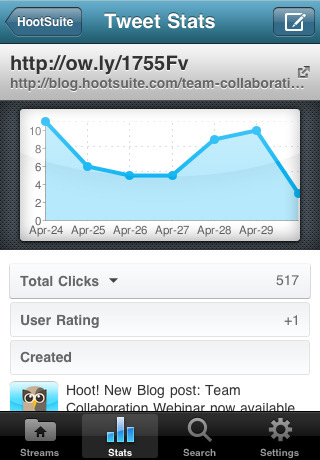 Join the conversation from anywhere with HootSuite for iPhone® and iPod touch®. Simple, elegant and powerful, HootSuite allows you to send and schedule Twitter, Facebook and Foursquare updates, track click stats, and set up tracking columns to monitor keywords, #hashtags and lists. HootSuite is international-ready with translation to/from over 50 languages plus the the interface is fully localized in 6 languages (Japanese, Spanish, German, Portuguese, Arabic, and Korean) with more to come. Available in Full version ($2.99 USD) and Lite (free) versions, HootSuite iPhone is tightly integrated with the web version allowing quick account importing and syncing with a helpful wizard. iPhone® and iPod touch® are trademarks of Apple Inc., registered in the U.S. and other countries. “Bump” is ™ of Bump Technologies, Inc. http://bu.mp/. HootSuite is also available on Google’s Android open mobile platform (http://hootsuite.com/android). Android™ is a trademark of Google Inc. Use of this trademark is subject to Google Permissions.